For the novelist, see Olivier Maulin. Maulin (Irish: Málainn, meaning "High or sloping ground") is a hill located in the northeastern section of the Wicklow Mountains, close to the border with County Dublin. The mountain can be found on a side trail off the main Wicklow Way. It is accessible via marked trails from Crone Wood carpark, located south-west of Enniskerry. The summit has views of the northern part of the Wicklow hills, including The Great Sugar Loaf and Djouce Mountain. The route to the summit is waymarked for the use of hillwalkers. Knockree An Óige youth hostel is located just below the summit. Much of the north face is forested with a Sitka spruce plantation, known as Crone Wood. 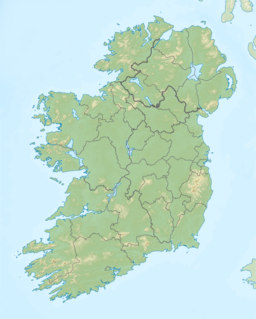 This article related to the geography of County Wicklow, Ireland is a stub. You can help Wikipedia by expanding it. This page was last edited on 26 September 2017, at 10:54 (UTC).